It was supposed to be fragranced with peppermint and vanilla, but when I was preparing to make the soap I realized that the french vanilla fragrance oil I mixed with my peppermint e.o. was going to turn the soap quite dark, and I really wanted to soap to stay lighter. Because I had already had my oils and colors ready, I just decided to dig through my fragrance stash for something that was still Christmas-y but wouldn’t change the color of the soap too much. The fragrance I used was Sleigh Ride, and I did have a tiny bit of leftover peppermint e.o. that I added to the fragrance, but it certainly didn’t come through as much as I was hoping. It is nice though, a combination of pine and peppermint, I can detect some soft spices in there are well. 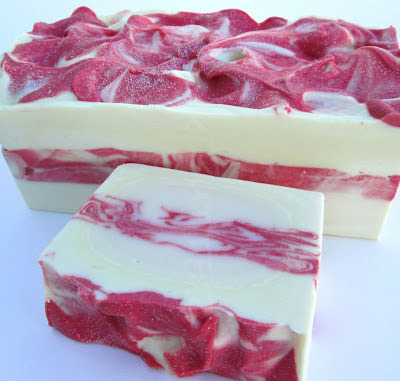 To make the layers, I brought the soap to a thicker trace and poured a layer of white soap in the mold first, then did a layer of in-the-pot swirl with a bit of red and white, then poured another white layer on top. I put some dots of red soap on top and used the back of a spoon to texturize the top a bit and swirl the red soap slightly. The red is NG Tomato Red with a bit of red iron oxide mixed in to boost the color. I also added t.d. to my oils at the beginning, which in retrospect I realize wasn’t a very good idea because the red color might not get as dark, but it still appears to have turned out okay. It looks like I got a partial gel too, even though I put the soap in the freezer and then the fridge overnight! Gorgeous! Love that layer of swirl, so cute! I have the Sleigh Ride FO too, can't wait to use it. Peppermint always heats up on me too. Perfect soap! It would be a wonderful xmas gift. Thanks so much guys! I didn't realize that peppermint heats up Laura, I'll have to remember that for next time. The peppermint seems to be getting stronger too as the soap sits. I think it looks GREAT! Although I just do M&P soaps. Great work! Gorgeous, Cee Gee! I love the layers. 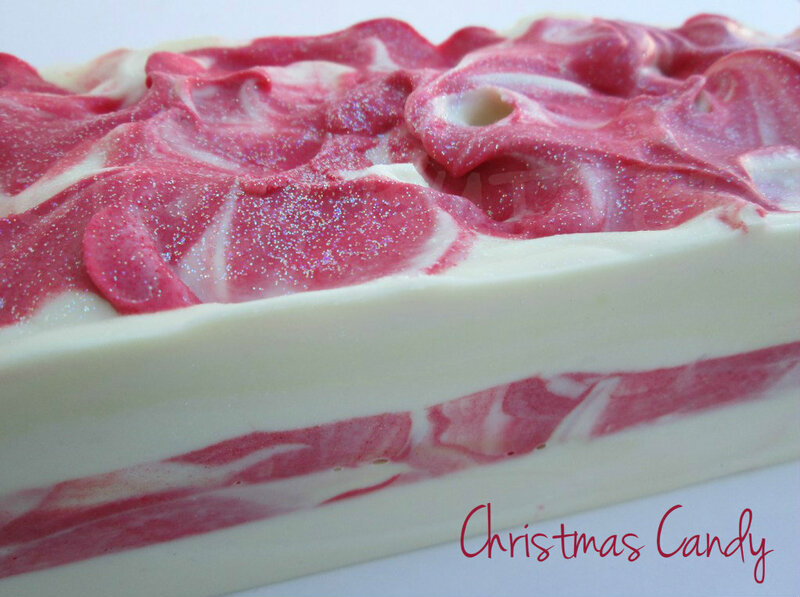 This soap looks like Christmas. Bravo! beautiful, I love everything about it! Can't believe it! I was thinking myself of making similar soap! This one looks just as I imagined mine. It's so beautiful, I wouldn't dare to try replicating it. By the way, I've always wanted to ask, but always forgot: how do you take (or make) these wonderful photos? So beautiful,I like everything about this soap!